One block done! 12 to go. Can't decide if I want to do custom or edge to edge. This is my quilt that will likely hang in my studio. This was a leftover block I quilted just to see how it would look. Both are gorgeous, Harriet. you do beautiful work! 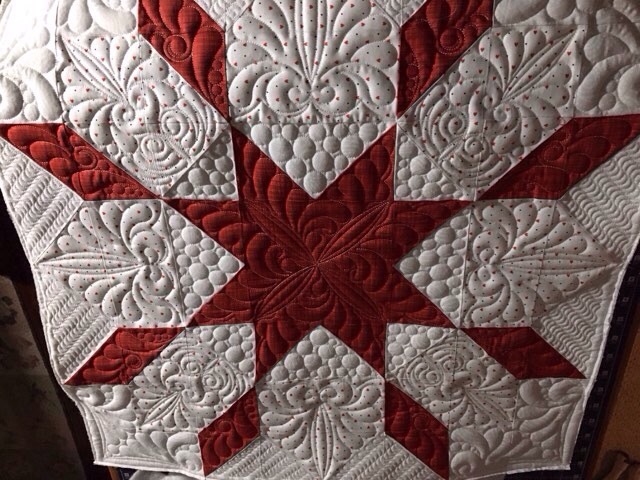 Great Heavens hcarpanini...I never think your quilting can get any better, but you consistently prove me wrong! The quilt is beautiful, of course, but the quilting is outstanding! Your sample is beautiful! If it is going to hang in your studio, how about quilting each block differently so you have a sample to show customers of different styles and fillers? The quilting of the sample block makes me swoon. The quilting just makes the design. Perfect. Your quilting is wonderful … treat yourself and your clients to a beautiful sample to hang in your studio! Wow! I think the custom quilting like you've done in the left over block would be wonderful! That is striking! You sure do beautiful work. That is a perfect name. Awe struck!! I'm sure whatever you decide to do with be outstanding. Please post when it's completed. Stunning quilting. You certainly have a creative edge with your quilting. Harriet, your custom is just wonderful--I vote for that! Is that hand guided or computer guided? (either way it's wonderful). Harriett, I absolutely love the leftover block. I have a white/red quilt on my bucket list. In fact, I already have the fabric. I love love love the red dot fabric with it. I am going to incorporate it into my quilt. Your quilting is, as always, fabulous. Thanks for sharing. Oh, by the way, your whole quilt is also beautiful! A fat quarter is not a body part! I appreciate your threads so much! I appreciate your comments about deciding how you will quilt a project, whether it is your project or one you are doing for a friend. 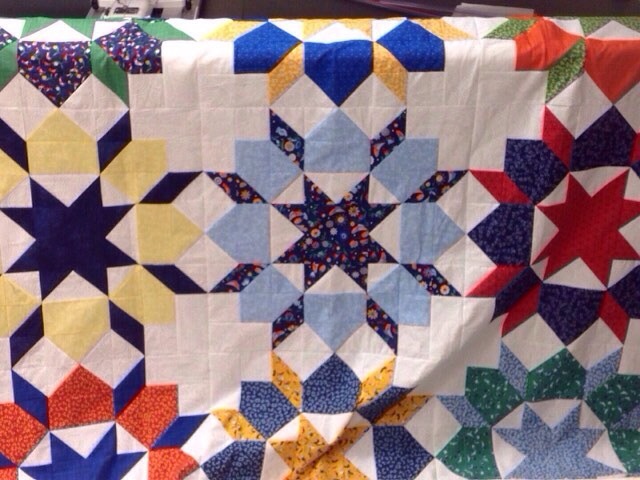 Sometimes, your beautiful quilting is the feature and other times, because of the thread color or motif, the quilting backs away to showcase beautiful piecing and color placement. On your single block above, the custom quilting is simply wonderful. Whatever, you choose to do for the quilt with the swoon blocks will be wonderful and when you post the quilt again you will encourage us to give some of these ideas a try. Thank you for sharing your work with us. Beautifully done...but I’m not surprised, your work is always stunning. I can’t wait to see photos of the finished quilt. Love the sample. Please post the finished quilt, we will be curious to see what you have decided. That (barn?) red and white is elegant. I'd like to see an entire two-color quilt done in that combination. Both are beautiful . . . however, the quilting on your sample block is EXCEPTIONAL!